Gilsland Park has been run by the Macnair family since the 1930's. In the beginnings, Gilsland was bought by Dr Robert Macnair, a Doctor in Leith, who, when out for a drive one weekend, passed a For Sale sign at the Old Fever Hospital and farm outside North Berwick. He thought it a perfect place for his patients to convalesce and after purchasing the fever hospital set about making it a place for people to visit on holiday or for a bit of relaxation and rejuvination – believing, as many still do, in the healing properties of the good, clean, fresh seaside air of North Berwick. At that time, Gilsland did not have many actual caravans onsite - generally the accommodation was just whatever people could get their hands on! A train carriage was lovingly converted into living accommodation, as was a single decker bus. Onsite facilities consisted of a tap in the field, everyone supplied and attended to the cleaning of their own privy and the grass was mown by a flock of sheep! After Dr Macnair retired, John Macnair (senior) gave up his shepherding post and he and Pat took over the running of Gilsland. They developed the holiday park by clearing land, planting trees and building the first toilet and shower block in the 1960’s. The site became increasingly popular with more caravans arriving every summer. A large holiday fleet was acquired which often saw the same families, from Edinburgh and Glasgow return year after year. The sheep were replaced by mowers and old tractors, see saws, swings, sand pits and “HMS Gilsland” were provided for the kids to play on. HMS Gilsland - still here! In 1990, Bill and Anna Macnair took over management. Caravans at this point had changed beyond recognition, not only bigger than ever before but also now coming with central heating, double glazing and their own bathrooms. So plans were set afoot to expand and develop an area of the farm into a new static caravan park which could accommodate and provide all the facilities now expected. Bill saw the new park developed, sadly the closure of the old park and on retirement the handing over of the reins to the 4th generation, Carlene and Adam Macnair in 2013. Handing the business to a 4th generation was a feat in itself as only 3% of family business' reach that point! Carlene and Adam have grabbed the opportunity with both hands and have continued to develop the business. With the increasing trend for Staycation’s the current major focus and investment has been on expanding Gilsland’s holiday accommodation. Talking of the new development, “Some things change but some things stay the same...Granny and Grandpa may no longer be with us and Uncle Bill and Aunty Anna have retired but Gilsland Park remains family owned and managed. North Berwick and East Lothian are so diverse in what it offers the holiday maker. We’ve got fantastic beaches, 5 * attractions from the Scottish Seabird Centre, The National Museum of Flight to the wonderful Castles of Dirleton and Tantallon and not only that, award winning restaurants serving amazing local produce. So the development of a stronger holiday fleet at Gilsland Park was a no brainer! For Summer 2017 we are introducing fantastic Upgraded Glamping Cabins as well as the “the small but perfectly formed” Gilsland Studios, ideal for families and couples alike. Both these types of accommodation are great for those looking for a quality accommodation with out a hefty price tag. They offer a wee bit more luxury but still allow you all to enjoy the outdoor life! As well as that there is still ofcourse our 2 & 3 bedroomed Caravan fleet which are upgraded ever year and offer easy, practical accommodation and finally, at the top of the range, are our increasingly popular 3 bedroomed Hot Tub Lodges. Part of this investment includes replacing the old, tired toilet and shower block with a 5 * building housing toilets and showers with underfloor heating – such luxury. Camp kitchens with hobs, microwaves and ovens for those days when the BBQ or a visit to the Lobster Shack is not on the agenda will also be available in these new buildings. And whilst we are all about kids being kids and playing outside – resistance is futile and wifi is now available at the park. The glamping units are set in a new green and car free area of the park – so kids are free and safe to enjoy the freedom that this type of holiday really can offer, whilst adults can enjoy the sheltered, south facing views over the countryside of East Lothian, North Berwick Law and Adam’s little flock of sheep – now with lambs at their feet! Adam is certainly a novice shepherd but he and his dog Corrie enjoy expanding their skills and it’s our little nod to Grandpa. Development of the business is important to us but always at the forefront of our mind is; What is it that makes Gilsland special and unique and keeps people wanting to return year after year? We think it’s * Quality * Style * Personal *Unique * Family Time * Old Fashioned Play and * Space – Space for kids to be kids and adults to relax .....so we’ve given all these things priority in the business’ development. 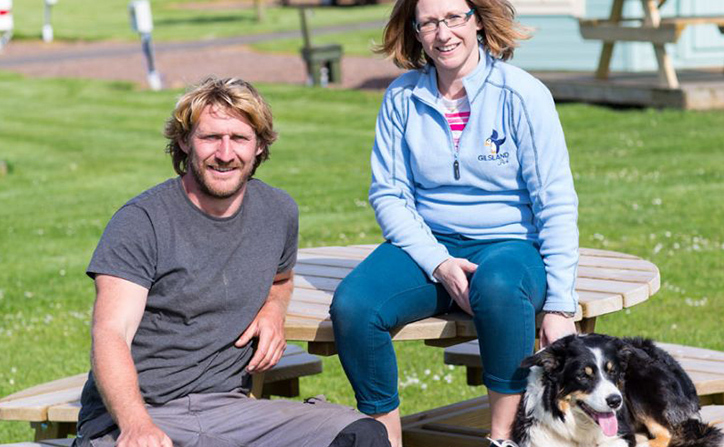 So, whilst some things will change, some things will definitely stay the same and Gilsland will continue to be a relaxed, family run holiday park.” Carlene Macnair. But we'd love to hear from you. So please, book in - enjoy 20% discount and be the first to give your feedback on the new accommodation! We will be keeping you up to date with photos on the development and the fantastic new accommodation – if you want to enjoy a quality short break with your family and make your own special memories, check availability and book up here Check Availability and Book Here Use promotional code July20 to enjoy 20% discount in the Glamping units and Family Studios.